The PEEM III equipped with a 180° imaging energy analyzer is an extremely simple, compact and productive instrument. Straightforward alignment procedures reduce the preparation of a measurement to only a few minutes so that you, your students and users can focus on research. 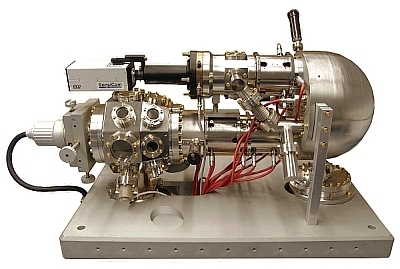 The microscope is versatile and can host up to 8 evaporators or light sources. Its installation at a synchrotron can be very useful for high spatial resolution XPEEM and XAS measurements. Furthermore, the full k-space can be directly acquired in a single image and dynamic band mapping can be performed. A great advantage of the Elmitec PEEM III with analyzer is that it is possible to make measurements at a synchrotron while growing a thin film. The installation, refill or exchange of evaporators requires only a short bake out and degassing of the evaporator filaments. Please contact us for more information or visit our components page for exchange parts and upgrades.